Your Health Span Massage Calgary! In-Home massage, acupuncture, and wellness company. Your Health Span has been providing services including In-home Massage to Calgary, but also providing in-home acupuncture, wellness, in-office massage and spa services since 1999. Services including massage therapy are all performed by therapists that are licensed and registered. 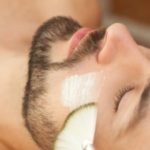 We also provide acupuncture, body wraps, and scrubs, facials, and reflexology that we know will help you thrive at work and at play. We bring everything we need for in-home massage or in-office massage therapy services. But we also provide a variety of other services that will help you look, feel and be the best that you can be. Our amazing team of wellness therapists includes Dr of Chinese Medicine, Estheticians and reflexologists who will arrive at your home with a choice of aromatherapy, Comfort Zone products from Italy, and everything else they need so that you have an awesome therapeutic massage or wellness experience. There are many ways offices can benefit from Massage Calgary services, whether you are trying to boost productivity or morale, or just build an amazing workplace culture. Your Health Span Chair Massage Calgary services are here to make it easy! 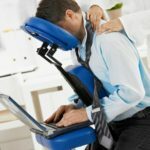 So whether it is staff appreciation, the start, middle or end of a big project, tax season, or you are building an amazing workplace culture, where your staff wants to work together for a common goal, an office massage program is an amazing tool for workplace productivity, employee engagement, decreasing sick days and increasing focus. Whether your team is a staff of 2 or 2000 (or more) we can work with you to make sure your goals are achieved, whether it is part of an ongoing program or just a once in a while event. It is a great way to spend time as a family, and we work 9-9, so your kids can get massage therapy while you are cooking supper, and then you can get your massage while they are doing their homework. Our mission is to provide you and your family with a truly relaxing and healing experience. And we can also direct bill your insurance company for you so you don't have to worry about paying us. We also offer Acupuncture and Traditional Chinese medicine, so if you are suffering from chronic pain or illness, call for a consultation. Acupuncture is effective for a wide range of issues including weight loss, high blood pressure, fertility and much, much more. We can also direct bill your insurance for these services. All our in-home spa services are done with Comfort Zone products imported from Italy so you can be assured that not only will your service be very relaxing and enjoyable but also effective as well.